The richness, luminescence and depth of layered glass continues to intrigue me after over 20 years working in the medium. As a material, it forces decision making unlike any other. It’s frustrating and unforgiving. That said, I still love it and feel the excitement of opening the kiln after a firing. 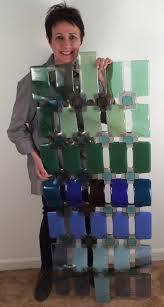 Nina Cambron – a glass artist extraordinaire! 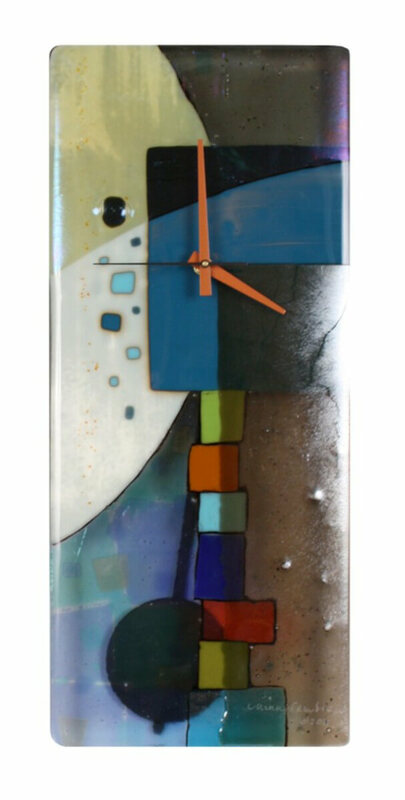 Fused glass represents a magical canvas of color and light for Nina. 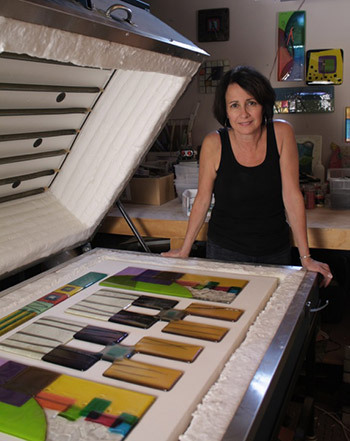 “The richness, luminescence and depth of layered glass allows me to express my creativity in its purest form,” she says. She describes her work as being “in a constant state of flux, not just season to season but piece to piece, as each result influences the next.” She says a BFA degree along with 30 years of graphic experimentation, work in clay and metal, a love for words, a whimsical versus serious bent and love for the human figure play a huge role in her current work. I come from a line of Makers and entrepreneurs and knew from a very young age that I would be a Maker. My grandparents from both sides and my parents were Makers. Grandpa Cambron designed and made bicycles in Belguim before immigrating, Grandma Cambron owned a millinery shop. My maternal grandparents started and owned a dress factory in Michigan after immigrating from Persia. It employed many women during WWII. My mom went to art school in Chicago during the war and that’s where she met my father. They moved to Michigan after the war and started Cambron Engineering, a tool and die company. It still exists to this day, bears the Cambron name and is employee owned. Hard work, long hours and determination are in my blood. I grew up with a mother who was a painter, seamstress and everything else creative. She had a huge easel in our family room and I was beside her with my own. At the age of 6, I was selling hotpads made on a little loom to neighbors. By 7th grade, I was selling macrame purses and wall hangings at galleries. I learned about metal, too and lathes and mills from my dad. I often accompanied him to the “shop” on weekends. David Hockney, Gustav Klimt, the Impressionists, Rothko, Alex Katz, Chuck Close to name a few. Age 6. Happy to be an artist! With a painter as a mother, I was brought up living & breathing color. With a father as a toolmaker, I learned a love of metal and how to make things. Combining these has driven my exploration into glass and what can and can’t be done. Stretching these limits is a challenge I embrace.